Painting hives is a good way to protect their wood surfaces from the elements. However, there are several important factors to consider — and dangers to avoid — when painting your bee’s home. Like almost every other aspect of beekeeping, a little research will bring up many strongly-held opinions on painting bee hives. You can find information on brands, types and colors of paint, and even recommended designs for decorating your boxes! No matter what advice you follow, these painting tips will help you provide the safest home for your bees. The outer surfaces of hives are exposed to sun, rain, temperature fluctuations and everything else Mother Nature throws at them. When left unprotected, most wood will quickly begin to break down under this stress. Joints will begin to crack, wet areas will rot and flat surfaces will warp. Eventually, these problems can advance to the point where the interior of the hive may be exposed. Adding a protective layer of paint works to avoid these issues for much longer than bare wood alone can manage. Many beekeepers do not want to draw extra attention to their hives. Whether you’re concerned about nosy neighbors, curious kids or even malicious vandals, painting a hive to blend in to its environment is a good idea. Many suburban keepers paint their hives in the same color scheme as their hose or surrounding buildings. In rural areas, keepers often opt for colors that blend into the surrounding foliage. Depending on where you live, the colors you choose for painting the exteriors of your hive can help keep the interiors comfortable for your bees. In hotter climates, painting hives white or another reflective color keeps the hives cooler during the warm summer months. In colder northern areas, a darker color can help absorb more of the sun’s warmth during the winter. Keeping your hives a little warmer makes a big difference on how much honey is needed to survive through spring. 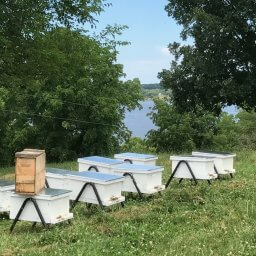 Many beekeepers delight in trying out different arrangements and sizes of boxes to find just the right combination for their particular circumstances. Once a collection reaches a certain size, it can take some effort to tell one size box from another. Some beekeepers use a color system when painting their boxes to help tell the different sizes apart quickly and easily. As we mentioned earlier, there are many opinions on what types and brands of paint are the best when painting hives. Some beekeepers use whatever is on sale or in the discounted “oops” section of their local home center to get the best deal. Others will pay premium prices for the best-rated brands in just the right custom shade to match their homes or existing hives. No matter what factor you decide is most important to you, be sure you are choosing paint that will not harm your bees. In general, look for water-based latex paints rated for exterior use with low levels of VOCs, or volatile organic compounds. VOCs are chemicals that evaporate out of the paint as it dries and cures, a process called off-gassing. Levels of VOCs are measured in grams per liter and are typically marked on the label of the paint can or bucket. To prevent these chemicals from affecting your bees and their pheromones, look for paints with VOCs under 100. Those labeled 50 or lower are probably even safer. Some bee keepers prefer to use clear coatings or stains to protect their hives without hiding the natural beauty of the wood grain. Again, the guiding rule is to use water-based coatings with low VOCs. Even with a low-VOC paint, you should leave plenty of time for the off-gassing process to take place before introducing a colony to your hive. Be sure to read the label for the paint manufacturer’s listed curing time. Add a few days or even weeks to the curing time for good measure to account for differences in your region’s temperature and relative humidity. This process cannot be rushed, and your bees will thank you for planning ahead and leaving enough time to make their home as welcoming as possible. What Surfaces Should be Painted? The rule of thumb for painting hives is to cover any surfaces that are exposed to sun and rain, and leave surfaces bare where bees walk and live. This means the interiors of boxes, entry ways and all interior components such as frames should not be painted. Dadant & Sons Pro Tip: Want to make sure your hives are protected from the elements but don’t have the time to paint? Order our Assembled and Painted Starter Kit! Have questions? Give us a call at 888.922.1293 or contact the closest Dadant branch. For beekeeping equipment and educational materials, visit our online store.